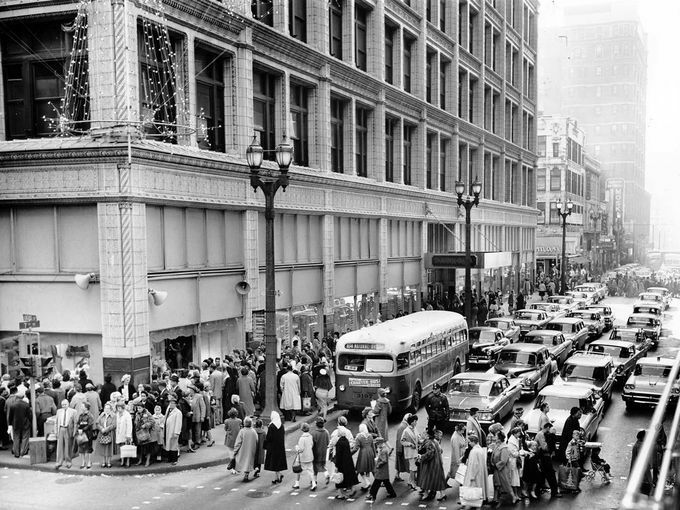 A Public Service bus is seen amid downtown streets that are filled with Christmas shoppers at the intersection of Seventh and Locust Streets outside the Downtown Famous-Barr in 1960. While the Macy’s downtown is now closed, there are lots of small retail options downtown for some last minute holiday shopping. All the people on the corner are looking at the electric train display in the window. It was put up every Christmas season in the same window of the Famous and Barr department store.